Google Allo has added support for Hindi, for its Google Assistant and Smart Reply, two of its key features. While Allo is not the best IM app in the world, or India, it is kind of nice to see it evolve into a better one since it was launched. 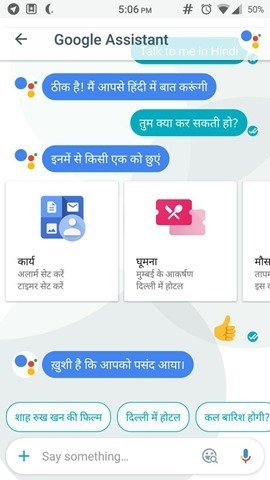 How to use Allo in Hindi ? Fire up the Google Assistant, type in the words "talk to me in Hindi", and it will switch to it. You can switch to English anytime you want, as Allo recognizes the language you type in. So ask your question in Hindi or Hinglish, and it will reply with a corresponding result/answer in Hindi. Smart Reply is so cool, that it will allow you to reply in Hindi, by using the app's prediction engine, which suggests entire sentences to your chat. So you can reply with a tap. The feature is already available in the current version of Allo, as it is a server side update.